Ultra-moisturizing eye creme relaxes and fills lines and wrinkles in the delicate eye area. Ultra-moisturizing, retexturizing eye creme relaxes and fills lines and wrinkles in the delicate eye area from within. Patented peptides signal skin cells to act younger. Delivers dramatic results in days. This wonderful lightweight creme counteracts the most critical concerns of the delicate eye area with a 4-phase anti-aging, wrinkle-reducing strategy. First, Hyaluronic Acid “Lifting” Spheres fill lines and crow’s feet from within by absorbing and trapping water in surface skin cells. As each sphere swells with moisture, eye wrinkles fill and lift to create a smooth, fresh appearance that lasts for hours. Second, Myoxinol™, a natural oligopeptide derived from okra hibiscus, relaxes lines caused by microtension and repeated facial expressions within minutes. Next, Dermaxyl™, a patented ceramide/oligopeptide blend, signals repair cells to focus on damaged areas caused by aging processes. The result is a supple, firmer, less lined eye area. Fourth, Astaxanthin, the most powerful antioxidant in the carotenoid family, (10x stronger than beta carotene and 500x stronger than Vitamin E), delivers powerful protection against oxidative damage. Skin aging free radicals are neutralized before skin cells, cell membranes and tissue become damaged. Intensive Eye Therapy Creme sends moisture deep into skin’s surface – yet is so lightweight, it won’t weigh down the fragile eye area or cause eye make-up to run. Skin will look and feel smoother and more resilient immediately. This superior formula does not contain fragrance, mineral oil, lanolin, color, or parabens. Gently apply to lined areas surrounding the eye twice a day for best results. Using Intensive Eye Therapy Creme after any serum with a hyaluronic acid base, (Eye Bright Treatment serum, Relax-A-Line™ serum, SuperMax Multipeptide Skin Solution serum), will pull this highly effective moisturizer deeper into your skin for enhanced results. 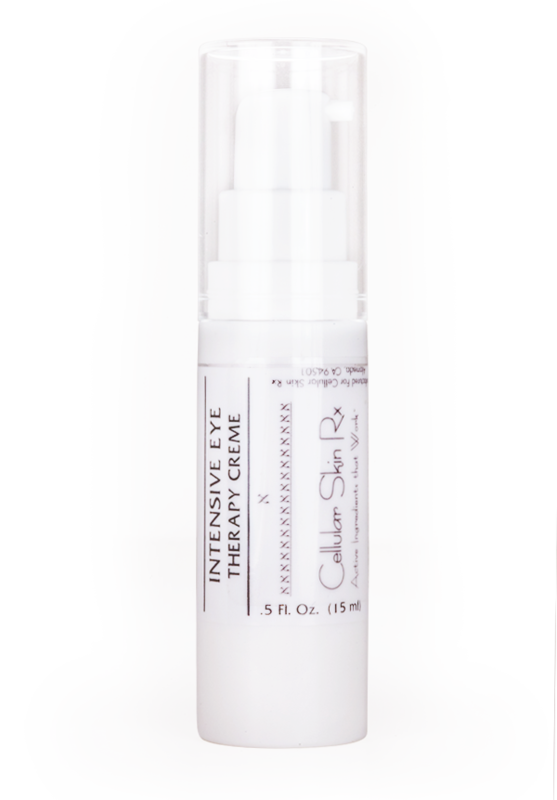 I wanted to let you know that I love Cellular Skin Rx’s Intensive Eye Therapy Crème. I have been using it for a while now, about 2 years. I have gone away from it and tried other eye creams, however I always winding up coming back to Cellular Skin Rx’s Intensive Eye because it’s the best I have found out there. It really works to bring moisture and smoothness to my entire eye area. My concealer glides on over it and stays all day. Thanks for making great products that work.